Out with May in with June… temperatures bordering on 90 degrees has been sign enough to me that summer was here. Now with Memorial Day over swimming pools everywhere swing open their security gates. We took a dip in our neighborhood pool last night, the water is still a bit chilly for me. 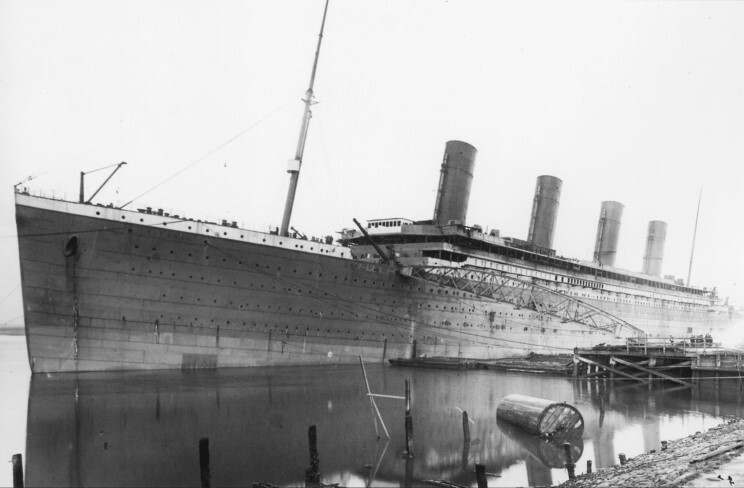 RMS Titanic was an Olympic class passenger liner that became infamous for her collision with an iceberg on 14 April 1912 and dramatic sinking on 15 April 1912. Construction of the Titanic, funded by the American J.P. Morgan and his International Mercantile Marine Co., began on 31 March 1909. Titanic No. 401 was launched two years and two months later on 31 May 1911. The Woot-Off is still cranking folks. This entry was posted in Day in History, Videos, Woot-off on May 31, 2007 by Eric T.. I like when Wednesdays feel like Tuesdays.. that means that on “Friday” I won’t have to come into work. WiFi hedgehog? Yea, that’s cool.. especially if you live in a dorm or apartment with a bunch of open WiFi networks nearby. Nvidia is set to release software to allow your GPU to take over some cycles from your CPU when it is bored. Google has launched its new “Street View” feature for Google Maps… interesting. Alright, on to our Wednesday feature..
LIFE CHANGING TIPS AND TRICKS!!!! Hot on the heels of the May 9 update on how to sleep on a hot night, How to stop brain freeze! It is the season for cold treats, so take the time to read this over and avoid the dreaded BRAIN FREEZE! I have been using Geni.com for sometime to record my family tree.. it’s a great site with a ton of really nice tools/features. If you are into genealogy and might be thinking about putting your info into a system to help organize it.. I encourage you to try out Geni.com and let me know so we can be family friends. Oh, one last note from the genealogy end… someone that posts at the Geni.com site wrote a good guide on how to use social networking sites to find relatives. How about a quick movie review? Alright, we took Carson to go see Shrek the Third. It was really good, the whole family enjoyed it. They did very well at moving the story along from the first two movies using enough of the old schtick and characters from the previous flicks, while introducing a good amount of new material too keep it fresh. I often see movies in the theater and think that I would’ve been better off waiting to rent it for home viewing. Shrek the Third did not fall into that category. I will also be buying a copy to watch a few more times at home. John Stewart exposes the “Under Investigation” saying. This entry was posted in Catching Up, Haffey's Links, Movie Review, Tech News, Tips and Tricks, Videos, Woot-off on May 30, 2007 by Eric T.. They have located some kryptonite… let’s hope it doesn’t fall into the hands of evil. Been running out of good cursing material lately? Well, Ship of Fools are here to help with some Biblical classics. Here’s an excellent article called 10 Steps to Cell Phone Security… it cover a lot of very important ground that most people take for granted. What an AWESOME find this site was, Matt Groening & Friends Appreciation Society. Geni.com announced some new features today on their blog.. I’m especially excited about the printing feature. If you are into genealogy at all, this site is worth a look. Lightsaber for $33 in 33 minutes, I’m sooo making one. Someone at Disney I hope got in trouble. New Coke was introduced on April 23, 1985. Production of the original formulation ended that same week. New Coke was the unofficial name of the sweeter drink introduced in 1985 by The Coca-Cola Company to replace its flagship soda, Coca-Cola or Coke. Properly speaking, it had no separate name of its own, but was simply the new version of Coke, until 1992 when it was renamed Coca-Cola II. This entry was posted in Day in History, Haffey's Links, Tech News, Woot-off on April 26, 2007 by Eric T..
Bargain Alert: 320gb Hard drive for $80ish .. not too shabby. The woot-off is still cranking! Get it while it’s HOT! Do you work with code? Here’s a really neat little tool. Also, on the string of cool things from/for Google stuff… GMail loader! Import old “pre-gmail” mail into your GMail account. Dilbert is a riot today, so go check it out. Have a good weekend!! I’ve got a few things to keep me busy around the house and if we get some time we might go see the TMNT movie! This entry was posted in Bargains, Friday Funnies, Haffey's Links, Tech News, Videos, Weekend Seeking, Woot-off on March 23, 2007 by Eric T.. The first working laser patented this day in 1960. Sometime later, Dr. Evil uses this invention in his evil plot. My old employer tells the RIAA to pay them for wasting the University’s time… HA HA HA. Go UNL!! Here’s a funny link that Haffey sent me yesterday… funny stuff said in court. In honor of Haffey providing me so much material, I’ve added a new label “Haffey’s Links”… in time I hope to go back through what I’ve already posted and add the label when necessary. This way you can target just the posts with “Links provided by Haffey”(tm). What a laugh on this one! This entry was posted in Catching Up, Day in History, Haffey's Links, Tech News, Videos, Woot-off on March 22, 2007 by Eric T.. Yes, your dreams have come true… there is a Woot-Off today. Go get some goodies on the cheap. Microsoft’s commercial launch of Windows Vista is today… Win yourself a copy of the Ultimate edition here. I’ve been using the Enterprise version for a few months and it’s pretty nice if you have the hardware to take advantage of you. Looks like Yahoo’s widgets will play nice as well. Might put up some more later, as news releases roll in. HAHA… an automated parking garage. I’m still holding out from my jetpack. See following video for reference. In case I haven’t mentioned it, I am in the Alpha of Trillian Astra. I joined in at build 26 and we are now at build 28. I’m really liking the direction they are going and the second build is a lot more stable and had new features added. I have been dabbling in beta testing a lot lately and it’s been really fun. Here’s a shot of my desktop with Trillian running and 4 chat containers with 9 chat buddies in them. Last link of the day… Engadget does a round-up of the Vista reviews. This entry was posted in Tech News, Videos, Woot-off on January 30, 2007 by Eric T..
ICE ON THE ROAD, EVERYONE FREAKOUT!!!! So my normal 25-35 minute commute turned into a 2 hour slow crawl of patience testing, brake stomping fun. Between the overly careful drivers and those drivers with no regard to other human life, it was quite the epic drive. Pretty decent deal on a laptop over at SlickDeals… I would probably upgrade the video card and then price out upgrading the RAM to 2gb but otherwise looks like a decent offer. Like helping charities? Need some Mac Software? Let’s combine those attributes into this wonderful idea. IT’S TIME FOR ANOTHER WOOT-OFF!!! That’s all for now, possibly more later. This entry was posted in Busy, Woot-off on December 7, 2006 by Eric T.. If you’ve never been to woot.com, today is a good day to go. They are having a “woot-off”… which means they will continually have an offer up all day. Normally (as their logo states) they offer “one day, one deal”, basically a decent deal on some random product each day. The product will be available for as much stock as they have. Sometimes things get sold out before 8am, but when they have these woot-offs there’s something all day long and it’s different stuff. Gonna have other pics from Heather and Brett’s visit up today. For Heather, Bill Polian owns the Colts. Pics from H&B’s visit! This one is the best. This entry was posted in Pictures, Woot-off on November 16, 2006 by Eric T..